1 Remove the turkey from the fridge 2 hours before roasting as it needs to reach room temperature before going into the oven. Wash and pat dry. Mix olive oil and Knorr® Chicken Stock Cube to make a paste. Rub the paste all over the bird. Season generously with black pepper. Preheat the oven to 220°C. Cut 2 whole oranges into quarters and stuff along with sage inside the bird. Place the turkey on a wire rack in a large, shallow roasting pan. Slide into the oven and roast for about 20 minutes. Lower the temperature to 175°C. 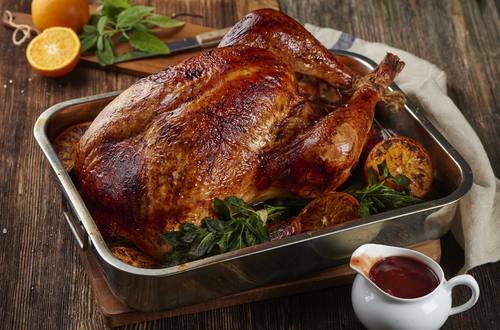 Calculate the roasting time based on the weight –30 minutes per 1 kg of turkey. Loosely cover the turkey with aluminum foil if it is browning too quickly. Rotate the pan if necessary. The turkey is done if the thermometer inserted in the thickest part of the thigh reads 78°C. 2 Remove the turkey from the oven. Cover the turkey loosely but thoroughly with the aluminum foil and allow to rest for 20-25 minutes before carving. 3 Meanwhile prepare the cranberry gravy. Place the cranberries in a medium bowl and pour over the boiling water. Set aside for 25 minutes. Drain and place in a sauce pan. Add the wine, Knorr® Classic Free From Gravy, the zest and the juice of an orange and the jelly. Simmer together for 10 minutes over low heat. Serve turkey with cranberry gravy.